And the public agrees, along with the critics apparently. As I mentioned a short while back, it's my favorite thing the new regime has done. It's also the most successful thing they've done. By far, actually. The ratings for the show were beyond what The Alphabet Network had hoped for. And out of all things done since John Lasseter entered the picture ("How to hook up you Home Theater," "Bolt," "Princess and the Frog," "Prep & Landing"), it's the one, true hit; the only piece of animation to make it out of the ballpark in every sense of the word. And with success comes more of what the people like/want. Another adventure with Lanny and Wayne is currently being worked on inside the story department of WDAS. It was to be. There is development being pushed for another special, although I don't know if it'll be another Christmas special and it most likely won't be ready for this year. But that is the thinking and another thought that hasn't yet been approve is to turn this into Pooh. Whahh? Remember how "The Many Adventures of Winnie the Pooh" was created? It wasn't made as a feature, originally broke apart into shorts. Walt didn't feel it was ready to be seen by the public as an entire film, so he broke it into pieces. Once the first part was a success, the rest moved into production and a few years after the last one was completed they combined all of them and put it together as a feature. No one today thinks anything other than it being a feature. By that I mean kids and most adults. The thinking right now amongst those at the hat is... maybe. They like this idea for the Christmas Elves, and that's the thinking of the moment. If the next special delivers the same kind of numbers it'll be a given that this strategy follows up. Does that mean we get a full film that gets a DVD/Blu-Ray release or a theatrical release? Too early to know for sure, but should the further adventures of these little guys prove popular then a combined feature will get at least a limited run (ala: "Tinker Bell") before going to home video. If all things go well, you might see a full release on the schedule, but not for a few years. Think 2012 or 2013, at least. But it's fun and great to hear. I don't know if the original directors, Kevin Deters and Stevie Wermers-Skelton will be heading the project, but I'd trust it more if they were. When I first sat down to watch Prep and Landing and saw it opened with 'Lenny and Wayne the Elves in..' I wondered about the possibility of a sequel or a series like the Wallace and Gromit series. Then the film was awesome and I said, "BRING IT ON!". Thanks for the inside Honor, good work. Great news! Is this what you Tweeted about, Honor, when you had news you couldn't talk about yet, or was that something else? "Is this what you Tweeted about, Honor, when you had news you couldn't talk about yet, or was that something else?" It's not. I am not able to talk about what I said I couldn't talk about. Oh so there is more secret things happening? Prep and Landing was excellent. It's the best North-Pole-based Christmas story since the classic Rudolph special. In fact, I would have loved to see Rudolph pop into that Prep and Landing special somewhere...given the weather situation, he certainly could have been useful (note to Disney lawyers: work on obtaining Rudolph for the next special. If that happened, the ratings would go through the roof). Anyway, I'd be glad to see more Lanny and Wayne. I loved the Disney version of the North Pole. I'd love to visit there. Hell, I'd love to WORK there (think the Big Guy could use an oversized elf?) Kudos to WDS for a fine job. It never fails. People will watch what is fresh and new. We're all tired of sequels and old stories rebooted. That's why Prep and Landing was a hit. Of course, making a Prep and Landing 2 instead of something else that is fresh and new falls back into the rut that they are barely climbing out of. Don't think of these as sequels. Think of them as a second and third act of one film. That's what it is with "Pooh." If they hadn't made the second or third one of those then I wouldn't have my favorite of the three (which is "The Blustery Day" btw). As long as they make entertaining stories with good animation I have no problem with them. When they start churning out bad plots and crappy animation you'll hear me chime in. 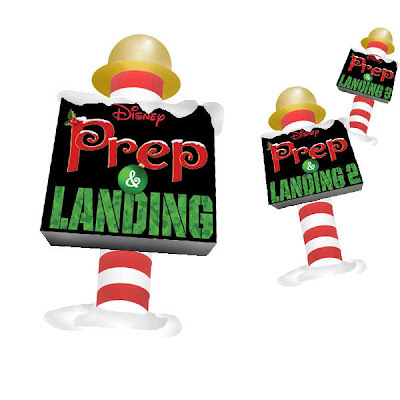 I loved "Prep and Landing," but its a sad commentary that the only unqualified success that Lasseter has produced out of WDAS is a network Christmas special. Doopey, thats still only an opinion. And in anycase that's perhaps a good thing. Feature films aren't the only way to use animation, it should be seen in short and middle length projects such as Prep and the goofy short. It's been missing from Disney for too long and finally they look to want to resurrect the tradition. It's most definately what WDAS should be doing and I wouldn't discourage that for the world. So no it isn't sad. It's probably quite predicatable since Prep is a comedy like most animated movies these days rather than a princess movie, and it has the whole x-mas special thing to help it along. I really didn't care much for prep and landing, was kinda dissapointed, and I wasn't even that hyped. I was definetly impressed by the full length feature look it had going for it, but didn't care for the story or execution much at all. Maybe the length was to blame, but I found it pretty forgetable. How to hook up your home theater was much more entertaining to me as far as shorts go. And not just because it brought back hand drawn animation, (as I like both) but it felt more timeless and classic. something I'll want to watch years from now. Prep and landing was holiday fluff, nothing more. The whole high tech Christmas thing has been done to death I think. A Prep and Landing film? Wow, way to milk a franchise. There doesn't need to be a theatrical release for this...let the animators work on something worthwhile. Even Pooh is a waste of time...it's just to keep the animators employed, it's not like the film will be epic.